In celebration, the Original Bigfoot truck will appear at Chili’s on Thursday, August 20, the day tickets go on sale. 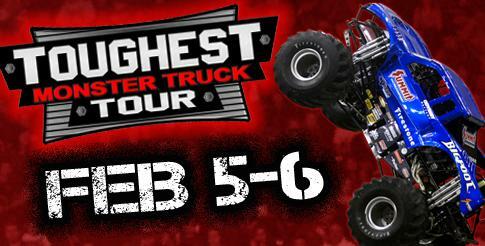 SALINA, KS ­– February 5th and 6th, the Toughest Monster Truck Tour is coming back to the Bicentennial Center in Salina with five of the nation’s toughest monster trucks, including Bigfoot, Over Bored, Quad Chaos and the brand-new Dirt Crew truck which looks like a dump truck. August 20 through September 18, adult tickets outside the gold circle are $5 off and free pit passes will be included with every adult and child ticket purchased. Kids (age 2-12) tickets are only $10 outside the gold circle. To celebrate this event returning for the third year in a row, the original Bigfoot will make an appearance at Chili’s in Salina on Thursday, August 20 from 4:00 – 7:00 p.m. In addition to monster trucks on a dirt track, this year’s event will also feature the transforming dinosaur robot, Transaurus, which is always a kid-favorite. The stars of Toughest Monster Truck Tour will get up close and personal with fans before each event during the Pit Party. Fans holding a pit pass and an event ticket will be allowed onto the floor of the Bicentennial Center before each event. Free pit passes will automatically be included with every ticket purchased from August 20 through September 18. The Toughest Monster Truck Tour begins at 7:30 p.m. on February 5 and 6, 2016. Kids age 2-12 can sit outside the gold circle for only $10 in advance and discounted family 4-packs and group rates are also available. Tickets are available at the Bicentennial Center Box Office, bicentennialcenter.com and by phone at 888-826-SHOW (7469). All seats are reserved. Additional fees may apply. For more information about the Toughest Monster Truck Tour, visit www.toughestmonstertrucks.com.